Contributing to a growing body of research on the economic benefit of industry credentials, the Public Policy Institute of California last month released a study of employment outcomes for students in health Career Technical Education (CTE) programs in the California Community College system. In California, 18 of the top 25 wage-enhancing degrees are in health. As such, helping students obtain a health-related credential could be one strategy for closing achievement gaps and providing underserved students an on-ramp into the industry. The authors of the study examined data for a total of 120,000 students enrolled in health CTE programs in California community colleges over the past ten years. Their research found that, despite variations in completion and persistence across different programs, students who obtained credentials increased their earnings by 51 percent compared to non-degree holders. Earning a credential translates to real changes in earning opportunity. According to the study, students who were not previously employed in the health industry saw a median increase of $8,661 in quarterly earnings after completing a degree or credential. While a health-related credential may create economic opportunity for underserved students, completion gaps between subpopulations persist. According to the study, there is a six point gap in completion rates for Latino students compared to white students, and a 12 point gap for African American students. However, the researchers also found that providing career guidance and support services could help close the completion gap by helping underserved students identify and complete pathways in high-demand career fields. Meanwhile, the National Skills Coalition released an early Christmas gift in the form of four 50-state policy scans. The scans are part of the organizationâ€™s Skills Equity series, which includes toolkits to help policymakers identify effective strategies for expanding access to middle-skills training. One of the reports dives into an increasingly popular method of addressing basic skills gaps, known as Integrated Education and Training, or IET. Now a required activity under the Workforce Innovation and Opportunity Act (WIOA), IET integrates basic academic education with workforce training in order to prepare adults with basic skills for the workforce. While these adults, who are often inhibited by limited English proficiency or mathematical skills, generally struggle to find job opportunities, research shows that IET programs can increase earning potential for students who take at least two credits and earn a credential. Other scans in the series include state policies on Stackable Credentials, AlignmentÂ and Job-Driven Financial Aid. A new report from the Center for Public Education provides a summary overview of CTE, including data and key questions to help policymakers make the case for expanding CTE offerings. While introductory, the report is essential reading for anyone new to CTE. The National Opportunity Index – which examines education, crime rates, job availability and other indicators to determine a snapshot of economic opportunity by county and state – is out with new data for 2016. While overall opportunity has remained stagnant over the past year, the index demonstrates an increase of 8.9 percent since 2011. In a series of policy papers released last month, the Education Commission of the States explores strategies for state and federal policymakers to form partnerships to support postsecondary education. One paper highlights opportunities to leverage the Workforce Innovation and Opportunity Act of 2014 (WIOA) to support community colleges, such as by using sector partnerships to create career pathways or offering programs that qualify for WIOA support. Weâ€™ve seen a lot of activity this year at both the national and local level to expand and systematize the use of industry-recognized credentials (including our own brief on credentials of value, which you can check out here). The U.S. Bureau of Labor Statistics even released a helpful guide that describes different types of credentials and their prevalence in different industries. While credentials can serve as a useful signal of workforce competency that is recognized by both educators and employers, many learners face a credentialing marketplace that is as confusing as it is expansive. To address this crisis, the Lumina Foundation in 2015 helped launch the Connecting Credentials Initiative, a collaboration designed to advance a well-functioning and sustainable credentialing system. Last month, the initiative revealed a 7-point action plan, based on input from more than 100 stakeholders, that articulates a vision for such a system. One group already working to advance this vision is an organization called Credential Engine (formerly the Credential Transparency Initiative), which last month announced the launch of a national credential registry. The registry is designed to allow job seekers, employers and educators alike to access information about myriad credentials in various industries. The registry uses common terminology and guidelines for organizations to publish comparable information, and provides free and open access.Â While the system is currently being piloted in 60 sites with plans to expand in the future, we look forward to seeing how employers, job seekers and third-party accreditors alike will use the platform to contribute to a more transparent credentialing system. Transparency is a key element in a successful credentialing system, particularly when it comes to identifying stackable credentials. 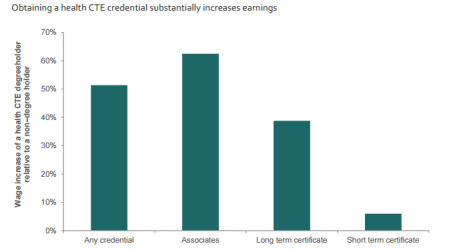 According to new research, longer-term credentials are associated with higher earnings, though the return varies on a sliding scale depending on the length of time and effort required to earn the credential. Job seekers must be equipped with the right information to obtain stackable credentials that enable them to enter and exit the labor market at various points, building on their education and experience as they go. Linkages to career pathways either through future employment opportunities or future education and training opportunities. Whose Job Is It? According to the Pew Research Center, 60 percent of Americans believe the public K-12 education system is responsible for ensuring the workforce has the right skills and education to be successful in the economy. Interestingly, the same study found that 67 percent of four-year degree holders believe their education prepared them for the workforce, compared to 58 percent for two-year degree holders and 78 percent for professional and technical certificate holders. Rate Yourself. Building on its College and Career Readiness Organizer, CCRS released a self-assessment scorecard to help state policymakers identify gaps and opportunities for preparing K-12 students for postsecondary success. Based on the needs identified in the survey, the scorecard provides additional resources to help states and districts in their college and career readiness efforts. The STEM of Success. The Education Commission of the States released a STEM Playbook last month as part of its â€œSepSTEMberâ€ campaign. The playbook identifies three core components of a successful STEM strategy: statewide coordination; adequate, reliable funding; and quality assurance or program evaluation. Across the country, employers are struggling to find qualified workers to fill critical middle-skill jobs. These positions, which require some postsecondary education but not a bachelorâ€™s degree, constitute the majority of the U.S. labor market, but new analysis from the National Skills Coalition (NSC) indicates that there arenâ€™t nearly enough qualified American workers to fill middle-skill openings, hampering statesâ€™ economies from growing and employers from hiring. Earlier this week, NSC released a set of 50-state fact sheets that examines these forgotten middle-skill jobs. Analyzing data from the Bureau of Labor Statistics and the American Community Survey, NSC found that middle-skill jobs account for 54 percent of the U.S. labor market but only 44 percent of workers fit into the middle-skill cohort. Conversely, the analysis showed a large surplus of low-skilled workers competing for low-skilled jobs and a smaller, but similar, surplus for high-skill workers and jobs. Career Technical Education helps to bridge these gaps in key industries. Students with a CTE-related associateâ€™s degree or credential can earn up to $19,000 more per year than those with a comparable humanities degree. The National Governors Association recently awarded grant funding to 14 states in an effort to help align education and training systems to the needs of the state economies. As a postsecondary degree or certificate rapidly becomes the new minimum for citizens to gain access to the middle class and beyond, states are looking to maximize their role in promoting collaboration among state agencies, technical training and education institutions to ensure business and industry have the skilled workforce they need to succeed and grow. Modify the use of resources and incentives to support attainment of the integrated vision. Friends of CTE Blog: Is there a Skills Gap, and can CTE Fill it? 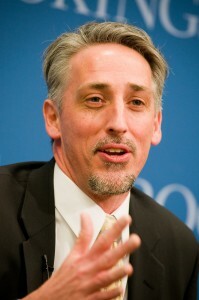 Andy Van Kleunen is Executive Director of the National Skills Coalition, which he founded in 1998 as The Workforce Alliance in collaboration with leaders from the workforce development and philanthropic communities. Van Kleunen has led the NSC to become a nationally-recognized voice on behalf of a diverse array of stakeholders, building upon his experience as a community organizer, a policy analyst, and a practitioner-advocate with roots in the workforce field.Â He oversees all aspects of the NSCâ€™s efforts, including building alliances with new partners as well as advising state and federal policy initiatives. Letâ€™s acknowledge up front that this is a worthy debate to have, and that there are valid arguments on both sides.Â But ifÂ youâ€™re running a Career and Technical Education (CTE) program with a waiting list of students trying to get in and a group of employers at the other end anxious to hire your graduates, this debate about a skills gap may seem a bit surreal.Â For you, itâ€™s not a question of whether recovering industries like manufacturing or healthcare are ready to hire; itâ€™s a question of whether our CTE programs have enough capacity to meet that demand. We know there is a skills gap and we know that CTE programs can help fill it. But skeptical journalistsâ€”including those who care enough to read economists like Capelliâ€”have a hard time believing there isnâ€™t something else at play when you have millions of people out of work and 3.5 million jobs going unfilled.Â Employers may say they canâ€™t find workers with the right skills, but that seems to fly in the face of the immutable powers of the market, where labor supply and demand automatically match up once thereâ€™s been a necessary adjustment in price (i.e., wages) to attract more candidates.Â If employers want welders, pay enough and they will come. Of course, this assumes there are qualified welders (or CNC machinists, or nurses, or ACE-certified auto mechanics, or rad-techs) sitting on the sidelines of the labor market, fully credentialed but not working because theyâ€™re waiting for a better offer.Â The fact you would be hard pressed to find an unemployed welder isnâ€™t acknowledged by these models; employers are snatching them up as quickly as they can find them. Â Nor do they acknowledge that there are many unemployed workers who would be happy to command a welderâ€™s starting wage, but that there arenâ€™t enough funded CTE program slots out there to train all of them. Capelli would add that, in addition to being stingy, employers are being overly selective.Â During my recent appearance on a radio show, the host claimed employers arenâ€™t satisfied unless applicants have the â€œwhole package,â€ the job market equivalent of baseballâ€™s five-tool player: literacy and numeracy, technical competencies, communications skills, the ability to work in teams, prior experience in the field. Employers are no doubt being more cautious in their hiring right now, for a variety of reasons (some better than others).Â But itâ€™s hard to ignore that some industries have changed substantially over the past decade, requiring candidates with broader skills than may have been expected for the same position 10 years ago.Â So is this an argument against further investments in workforce skills?Â Instead, shouldnâ€™t we be thinking about expanding opportunities for people to enroll in the kind of industry-informed, applied education and training that our best CTE programs are providing for their students in the classroom, through internships and even through on-the-job training?Â Such programs arenâ€™t cheap, but we know they can be effective.Â Just ask the employers who hire from them. So bring on the debate about the skills gap.Â But letâ€™s make sure we include the experiences of the CTE community and their partners in the discussion. TheÂ Friends of CTE Guest Blog SeriesÂ provides advocates â€“ from business and industry, to researchers and organizations â€“ an opportunity to articulate their support for Career Technical Education. The monthly series features a guest blogger who provides their perspective on and experience with CTE as it relates to policy, the economy and education. Are you interested in being a guest blogger and expressing your support for CTE? Contact Erin Uy, Communications and Marketing Manager, at euy@careertech.org.